Samsung's got problems: its Galaxy Note devices are bursting into flames, and have been banned from the skies. 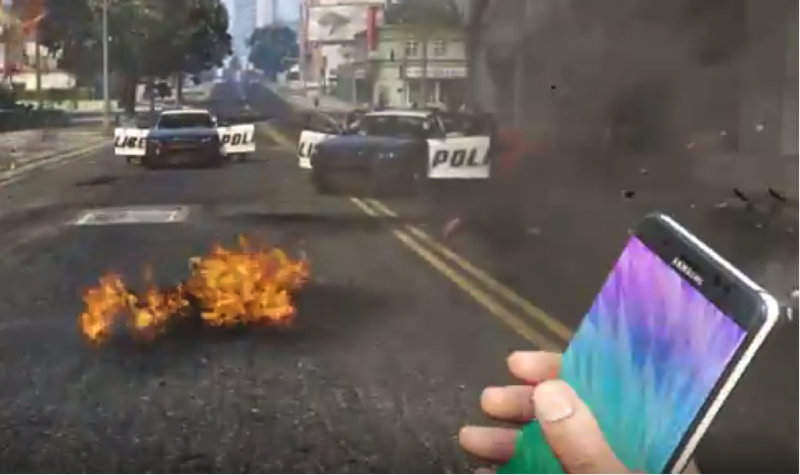 This headline-seizing bad news has prompted plenty of humor, including some gallows satire in the form of a Grand Theft Auto 5 mod that allows you to throw bombs that look like Galaxy Note phones, which explode spectacularly. As you'd expect, players are delighted with this, and have posted many videos of the mod in action to Youtube, whose Content ID system is notoriously friendly to copyfraud, where someone makes largely consequence-free copyright claims in order to remove something that they would prefer the rest of the world didn't get to see. But as the Electronic Frontier Foundation's Daniel Nazer points out, copyfraud is getting some consequences, thanks to EFF's landmark 2015 victory in the Lenz/Dancing Baby case, which established that companies that knowingly send out fake copyright notices can be made to pay their victims' legal fees, meaning that those who've been censored can take their pick of slavering, no-win/no-fee contingency lawyers who are only too glad to go up against deep-pocketed bullies. Lenz is up for consideration at the Supreme Court right now, and we'll find out any day whether they'll hear it -- if they do, we'll get a chance to strengthen the principle even further, so that companies that should know that their copyright claims are bogus are also liable.